The makers of Tamil star Suriya’s 38th film, being directed by Saala Khadoos/Guru fame Sudha Kongara, unveiled the film’s title poster yesterday. Suriya38 has been titled Soorarai Pottru. 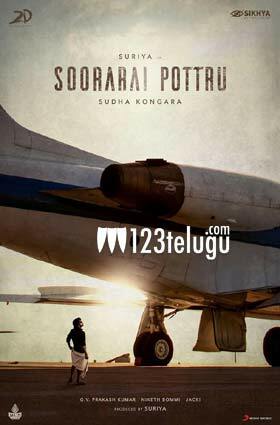 Soorarai Pottru’s poster showcases Suriya in a lungi standing against a huge aircraft. The poster hints that the film is going to be an ambitious venture in terms of content and scale. The film is said to be a biopic on Air Deccan Captain Gopinath. Gopinath had created a revolution in the aviation industry with low-cost airfares. Suriya’s production house 2D Entertainment is bankrolling the film in association with Oscar-winning Bollywood producer Guneet Monga. GV Prakash Kumar is scoring the music. Aparna Balamurali is the film’s leading lady.